I know you're probably looking at this card and thinking - where in the world did she come up with THAT! LOL! This is soooooo not me! A group I belong to on SCS called Stamp Addicts decided to start doing a technique challenge among ourselves to try to learn some new things. Darlene got it all coordinated and our fist challenge is the Reflection technique. You can find directions on how to do this in the Resources at SCS. Anyway, I read through the tutorial, then read it again - and again.....Ok, I can do that! But then when I started putting the stamp to the paper it was a totally different story! This was the end result.....and I really wasn't going to put that sentiment there, but, it's covering up this wonderful smudge!!! After stamping this baby about 15 times to try to get it right, I sure wasn't going to worry about a little smudge! I keep thinking of it as a work of art - you know, the further you get back from it the better it looks!!! So scoot back from your computer screen and you'll see what I mean.........looks pretty awesome now, doesn't it! LOL! We've got another Creative Belli Challenge for you beginning today! It's a Sketch challenge this time so come on over and join in on the fun! 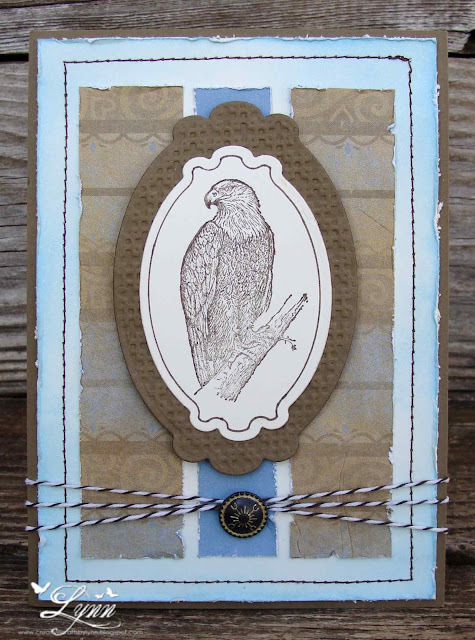 Remember, we'd like for you to use your old and forgotten embellishments on your project. Who knows, you may be selected as our next Guest Designer! Head on over to the Belli blog and play along. We'd love to have you. I used three different SU images for my card: Countryside, Teeny Tiny Wishes, and the Sanded Background stamp. With the Cherry Cobbler, Soft Suede, and Very Vanilla I thought it would make a great card for Father's Day. The DP is from My Minds Eye and I also added several buttons threaded with embroidery floss that I had in my stash. Thanks for stopping by.........and don't forget to enter the Creative Belli Challenge. Just a fun card to greet everyone with this morning! Hope you had a marvelous weekend. 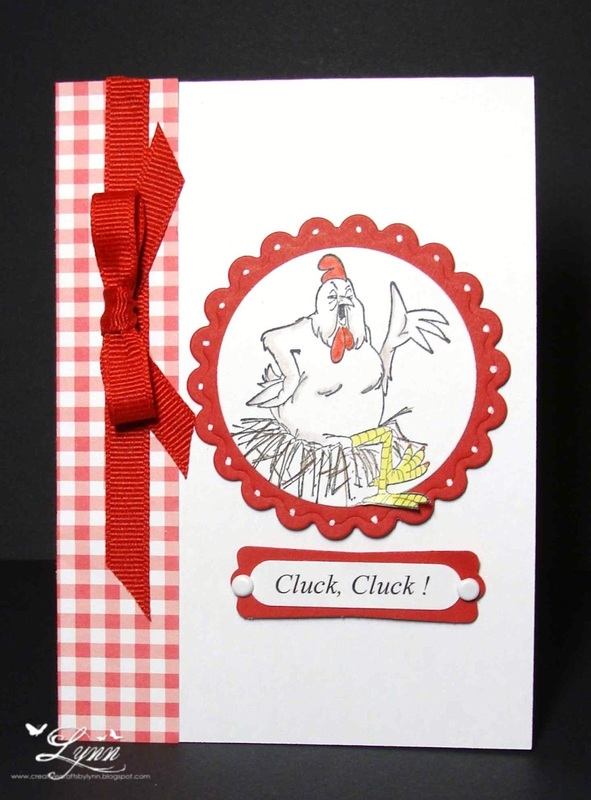 This little clucker is from Art Impressions stamps. Nothing fancy here but think it'll make a cute card for someone's birthday or other occasion. There's quite a few sentiments you could add to this, but thought I'd be nice and just give it the old "cluck, cluck"! I had every intention of doing a little zig zag stitching down that gingham panel, but it just didn't happen. Oh, well.... and I forgot to get a good photo shot of this when the sun was out so just said "OH, CLUCK" and put it on my post for today anyway! I'll enter this in the challenge at Art Impressions (clean and simple or anything but). Now on to my card........looks like this little guy and his dog didn't pay much attention to the sign at all! But they are having fun! The image is a freebie that I found on the OWH site. I made the cloud background using Tumbled Glass distress ink and tore some CTMH white core paper for the "ground". The image was colored with Prismas and then popped up. The sentiment is from OCL. I think this will be a fun card for a young boy - or maybe even a man, to bring back memories of his childhood.! I used the Star die from SU along with Night of Navy, Soft Suede, Riding Hood Red, and Very Vanilla. 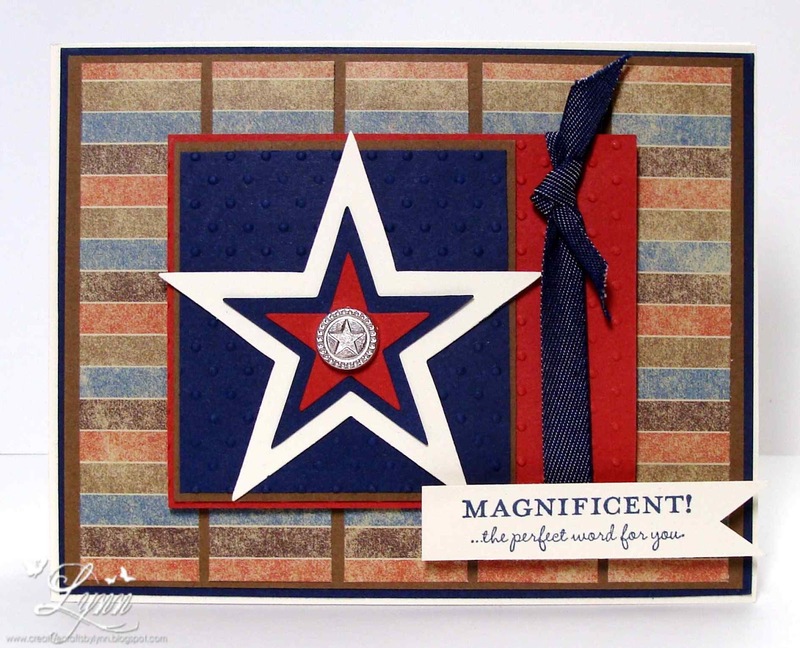 I embossed on the red and blue panel with the Swiss Dots folder and popped up the stars. The ribbon is some blue jean ribbon from SU that I bought quite a while back and never have used. I thought it went good on this masculine card so I'll enter it in the challenge Creative Card Crew (masculine) too. The sentiment is from Perfect Words (SU) and I topped that star with a silver star brad. One of the challenges recently at Less is More or Casual Friday - or somewhere.....was to make a CAS card and use ribbon. As usual, I'm too late to enter it into the challenge but for some reason it stuck in my mind so decided to make one anyway. This was actually going to be a one layer card (wouldn't you be proud of me, Kathy! ), but it was just too flat looking. So after I stamped the squares and added the sentiment - and ribbon, I went back and stamped the squares again and popped them up and then angled them on top of the original ones. So much for a one layer card! The ribbon is some I found at Walmart in the sale bin and really like the colors. It has just a tiny tint of pink in it and is really pretty - just looks a little ucky in the photo! I don't think it's ever too early to make cards for Christmas....so here's another one. I found this sketch over at Pals Paper Arts and will enter this into their challenge for the week. 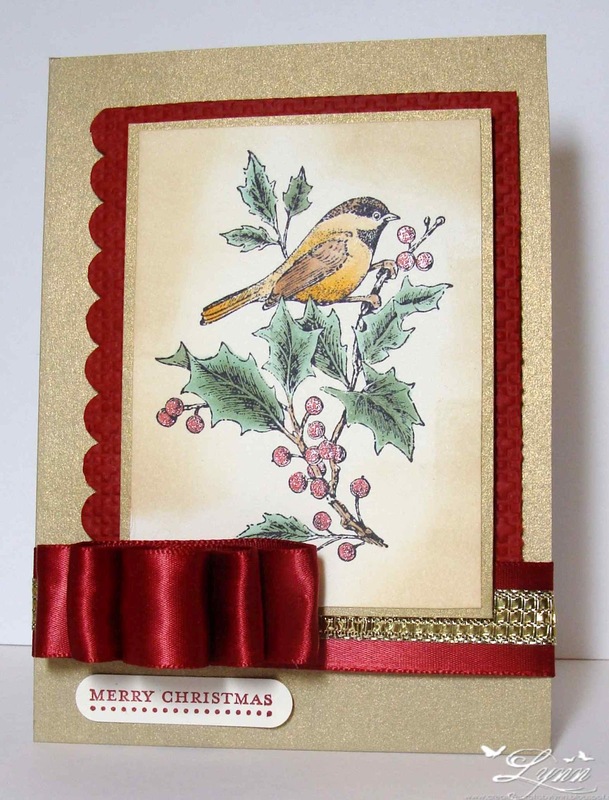 Clean and simple - but I have another Christmas card done for the year now!! The image is from SU's Beautiful Seasons and I paired it with Gold and Cherry Cobbler which I embossed with the Square Lattice die (SU).. The ribbon is pretty much the exact same color as Cherry Cobbler and I also used some shiny gold ribbon I had. The sentiment is from Teeny Tiny Wishes. I colored the image with Copics and then used a Spica red pen for the berries. It was lightly sponged with Antique Linen. My mojo has gone to Tahiti....Bottom Line!!! It left me all alone here in Texas to fend for myself....and I'm really not liking this deal at all! HOPEFULLY it'll return soon - um....or maybe I'll just head on over to Tahiti to visit! 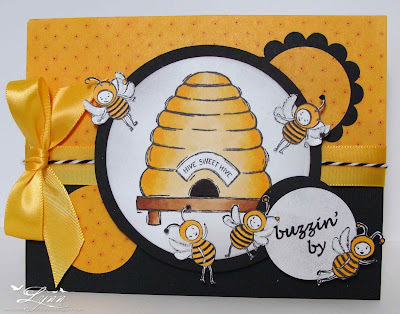 I subbed some of the smaller circles for these cute little bees and used my Just Buzzing By (SU) set. That DP was the very last tiny bit of scrap I had but it was just enough to do the top layer and punch out two circles. I used some black texture paper also. The hive was colored with Copics - as were the little bees. I added the ribbon and bow (with my Bow-Easy) and also ran a bit of black and white twine over the ribbon. 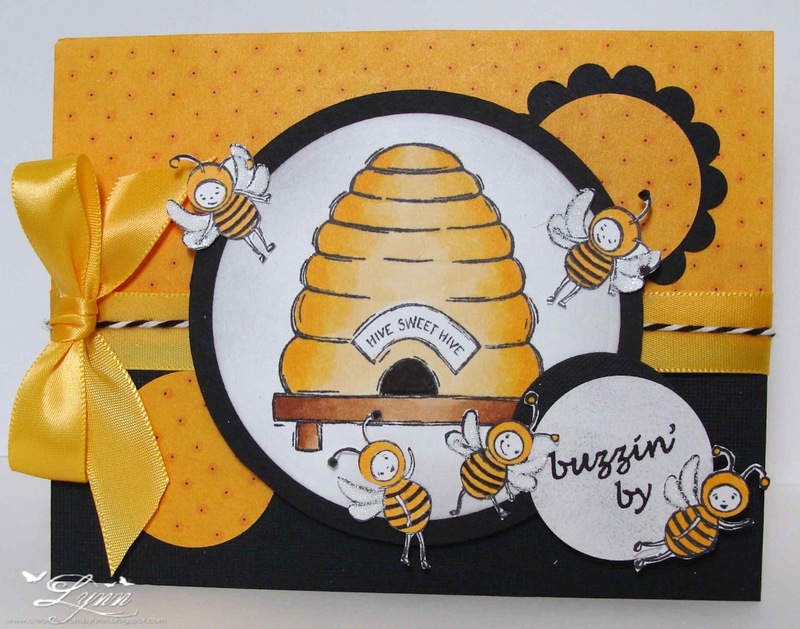 A lot of buzzing bees on this card! 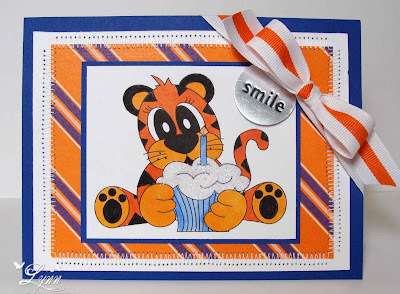 Anyway, I'll enter this into the sketch challenge over at Sketch Saturday, and also at Tuesday Throwdown (to use twine) and Cupcake Craft challenge (entwined). I don't have a Funny Friday for tomorrow but will be back soon! It's time again for another challenge over at the Creative Belli blog! Our challenge, that will run for two weeks, is a Recipe Challenge - 1 Ribbon, 2 Design Papers, 3 Colors, and 4 Gems (pearls). Remember that in keeping with the spirit of the Belli challenges, to use your old and forgotten embellishments! I used some Echo park DP along with Old Olive, Green, and White. The bird was punched with SU punches (Punch Potpourri) along with the little branches and the scallop edge. The square rhinestones are from CTMH that I've had forever and always forget to use. I used a very old Crazy 4 Challenge sketch for my card. Be sure and head on over to Creative Belli and enter your creation! This is one of the images from In Wilderness from SU. Not too many things are more majestic than an eagle and this will be a good birthday card (even though it's not until October) for my brother who is an avid bird watcher. Of course he'd probably pass out completely if he saw one of these in this part of Texas, so guess he'll just have to look at it on his card. 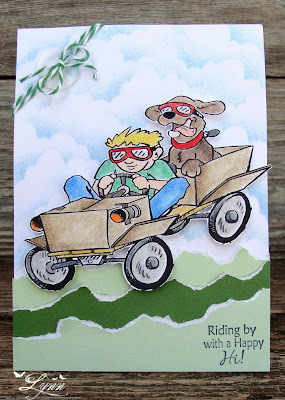 I used some Soft Suede and Very Vanilla card stock along with DP from CTMH. The DP has a little blue in in so I sponged the Very Vanilla with Tumbled Glass distress ink and then stitched and distressed on there and also on the three panels. (My sewing machine actually cooperated a little better on this card! 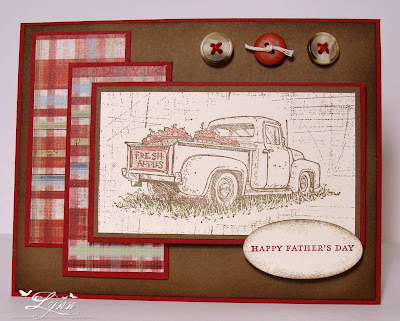 LOL) The image is framed using Spellbinders Label 10 - with embossing on the one in Soft Suede. After popping the image up on dimensionals, I added some Baker's twine and a SU brad. The sketch is from The House That Stamps Built and I'll enter it in their challenge. 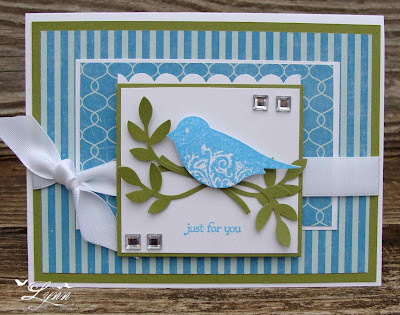 I'll also enter it in the challenges at Stampin For the Weekend (Color Inspiration), Hot Shot Craft (One for the Boys), and Digi Doodle Shop (also, One for the Boys). Time for another challenge over at Stamps R Us and our theme is Anything Goes! We're being sponsored by Digital Delights by Louby Loo who provided the cute images. You have two weeks to enter, so come on over and join in on the fun. We have a bit of news at the Stamps R Us Challenge - We'll be closing the doors and this will be our last challenge. You can read more about this on our blog. We'd like to thank everyone who participated in our challenges and we loved seeing so many wonderful creations! Thanks you! I've used Birthday Cupcake Timmy on my card for today. Is it bright enough for everyone!!! I used some K and Company DP and Brilliant Blue on here. The little "Smile" tag is something I've had in my stash forever. Oh, and before you even start questioning this..... NO, I was not drunk when I was stitching around the edges...I'd love to say it's just the camera angle in the photo here, but....um.......the truth is that I just couldn't seem to control the sewing machine any better! Sometimes it really has a mind of it's own, you know, and it just went wild on this card! LOL! 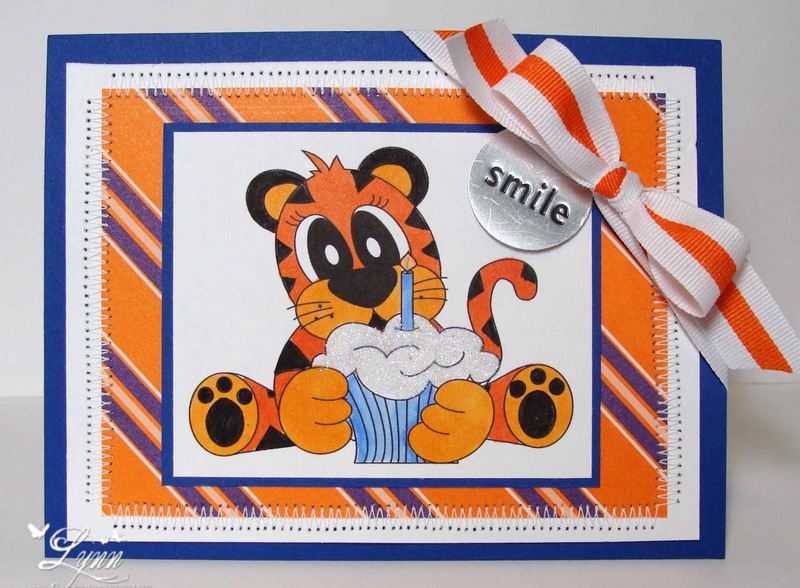 Be sure and check out the Stamps R Us Challenges and enter for a chance to win! Making the bed each morning - Why do we do that when all we're going to do is crawl back in it at night? It just doesn't make a lot of sense! Eating - I've always said if I could just take a pill and get the same feeling....think of all the money we'd save on food, dishes, dish soap, etc...and what a waste of time! And last but not least - The Bath! - Ok, now stop and think about how much water we're wasting just to get our body clean - and there's water shortages all over the world! But we take that daily bath. Of course we may smell better, but if no one ever took a bath, we'd all smell the same - Right? 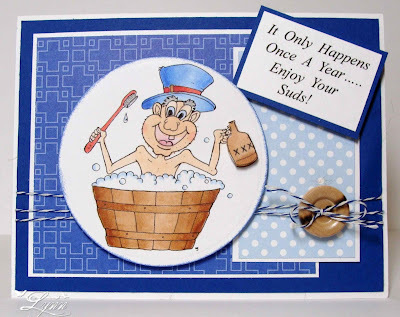 This little guy from Dude Time Doodles is taking his yearly bath - and why take more than that - I really don't think there's any little gals waiting in line to give him a hug anyway! He really is a cutie though and love his toothbrush and jug. Of course you can already guess this will be a birthday card and will hopefully put a smile on some guys face. Hope you have a good weekend thinking about some of these things.........and thanks for stopping by! Several weeks ago I was lucky enough to win this adorable Sarah Kay clear stamp from Cheryl's blog! (Thanks again Cheryl!) I'm already checking around now for more of these stamps as it's just too cute. 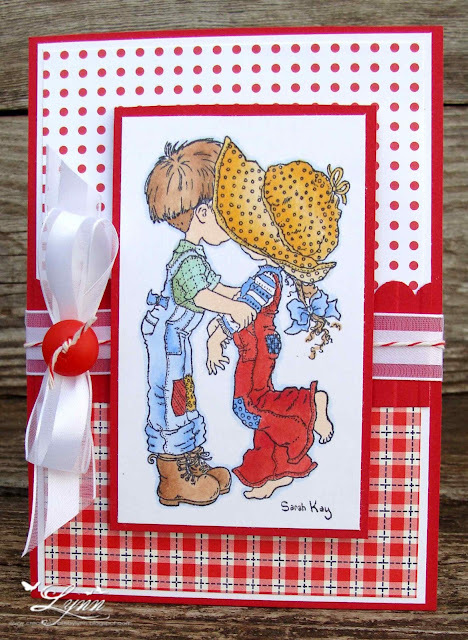 The little girl in the hat reminds of me "Sunbonnet Sue" - I know, I'm old to be remembering that - what can I say!! LOL! My design is based on the case study challenge over at Penny Black Saturday challenge - but since it's not a Penny Black image I can't enter it there. I will, however, enter it in the challenge over at the Ribbon Carousel Challenge (Anything Goes - but include ribbon, twine, etc.). I'm really hoping this is my very last Valentine's Day card....getting a little tired of them now! LOL! If I don't get off my duff and get busy creating this week though I may have to post another Valentine that I did several weeks ago. A very CAS card again using one of the Hand Penned Holidays sentiments from SU , the Swiss dots embossing folder, red card stock, and the ribbon......Ah, the ribbon! Last year I went to a gift/florist shop that was closing and they had everything in it for 90 % off. I found this ribbon for like a quarter and I know there must be at least 50 yards on the spool. I call it the Hairy Ribbon since it ravels out on the edges. LOL! 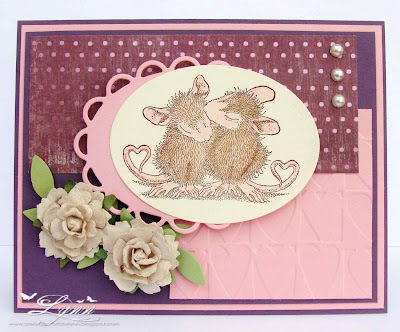 The reason you're not seeing a Funny Friday today is because I wanted to make a card to enter into the House Mouse and Friends Monday Challenge where you have to use more than one heart. They're also having a blog hop so you may want to check that out. 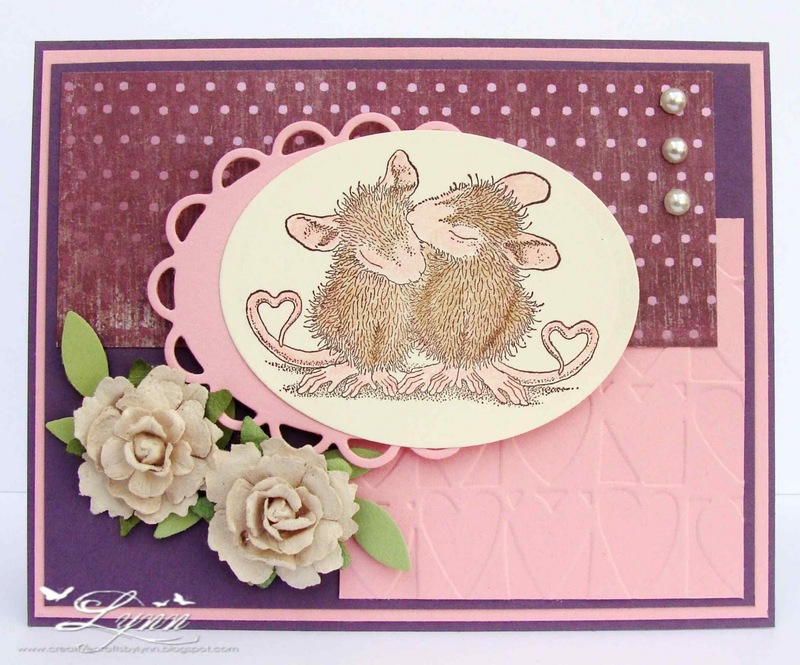 I've used the Tails of True Love image from House Mouse designs. Now, all of y'all know I do NOT "do" flowers! I see all of these lovely cards with absolute bouquets on them and see how beautiful they are....and then when I try to do that, it just looks like I've slapped some artificial flowers on there (as I've said before). I'm trying once again with this card though - and yes, it probably does look like I slapped them on here but I actually took my time with them and tried to arrange them in somewhat of a decent manner! I kept wanting to use "the rule of three", but three were too many, one was not enough, and two are what you get!!! That sort of sounds like Goldilocks and the Three Bears! LOL!! They're a mauve color and go with the pink and plum pretty good. 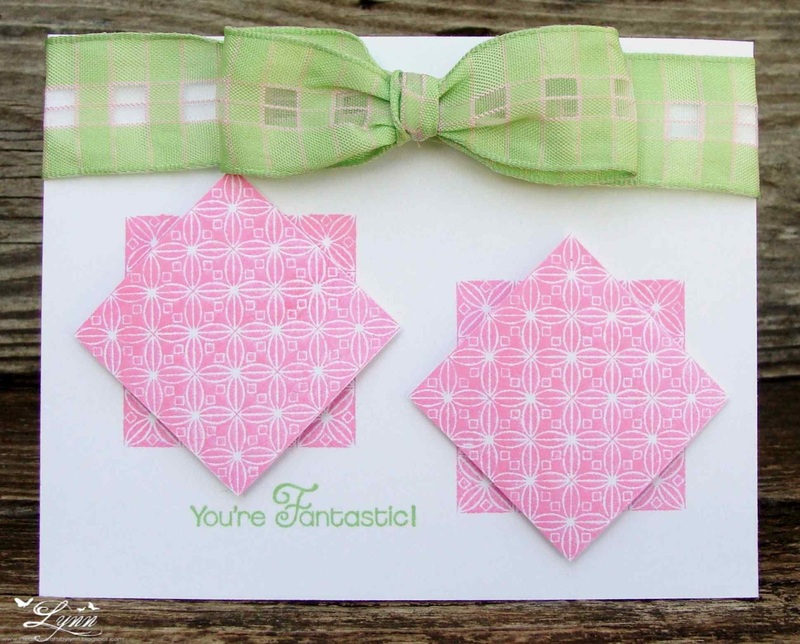 I used the Heart embossing folder on the Pretty in Pink panel and the DP is from Paper Studio. I also used some Perfect Plum - it actually matches (in a lighter shade) the solid background on the DP but I can't get the camera to cooperate with that it seems! I off-set the oval and lacy oval nesti and then added the image that was colored with Prisma pencils. The sketch I used is from Seems A Little Sketchy and I'll also enter it in their challenge. Sorry I've been missing in action.....will return tomorrow to visit all your wonderful blogs! Thanks for stopping by........and hope everyone has a great weekend. 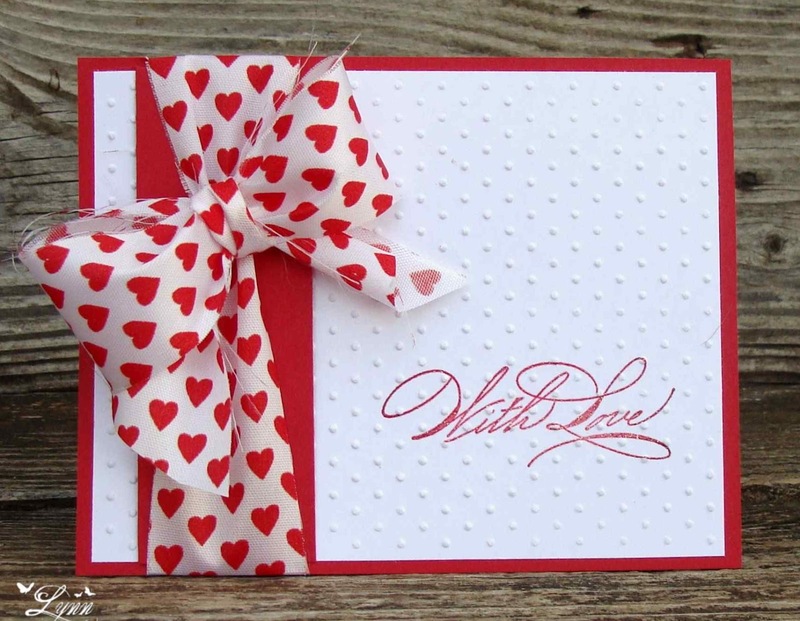 At Creative Belli this week the challenge is themed Heart/Valentines! You have one week to submit your entry and be sure and check out all the inspiration from the Design Team. Remember, in keeping with the spirit of the Belli Challenge, use your old and forgotten embellishments! 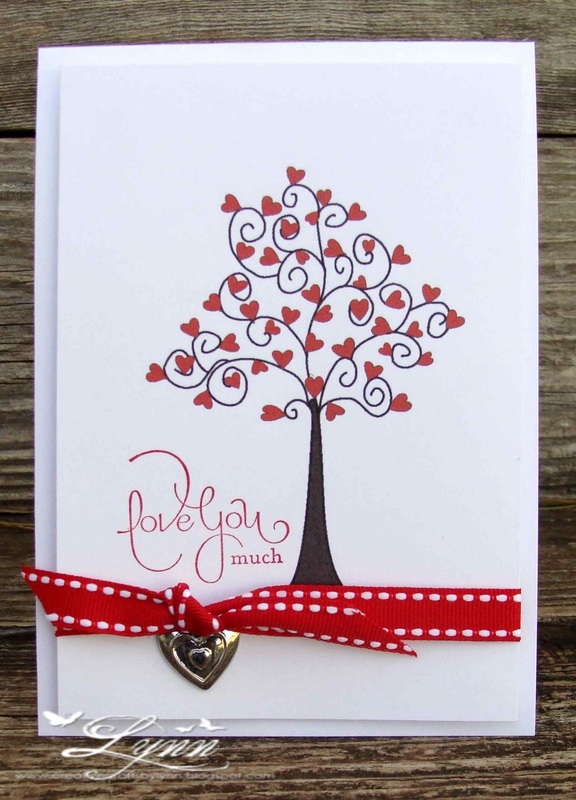 I decided to go VERY clean and simple with my hearts and lovin' you Valentine. The image was a free digi from Beyond the Fringe and I added a SU sentiment to it. The ribbon is some from my stash and the little heart charm was buried under a bunch of unused stuff I had. As I said, a clean and simple (git 'er done) card but will be a cute one for the upcoming Valentine's Day celebration. I'm going to be taking a small (very small) blogging break here but hopefully will return on Saturday or Sunday. I may try to post a card for Friday (not a Funny Friday though - maybe next week!) but we'll just have to wait and see. Thanks for stopping by..........and be sure and head on over to the Creative Belli blog and submit your entry.